Last night I brought to the table two aspects from two different summer squash, purchased on two different days, from two separate farmers. 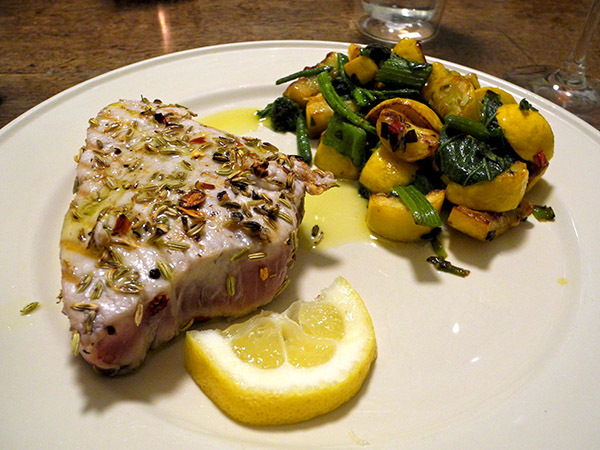 Oh yes, there were also pan-grilled tuna steaks. Note: The Sierra pepper was pretty mild, by nature, so I eventually added more of the colorful chopped morsels, but unfortunately only after snapping this picture. 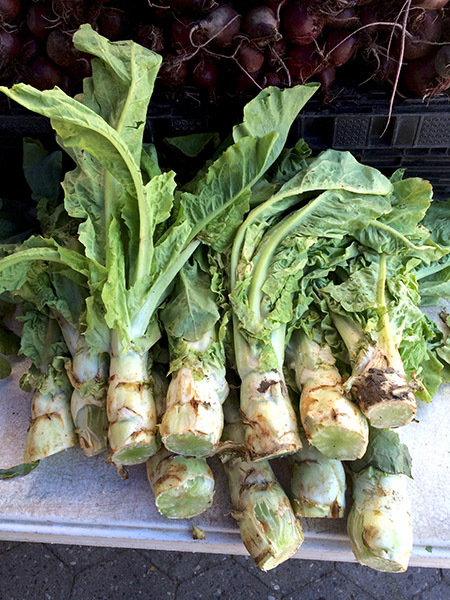 I had never heard of celtuce before visiting Zaid and Haifa’s stand in the Greenmarket on Monday, but I will say it was a revelation, for me a wonderful new vegetable (and new vegetables must be encouraged). It was terrific. 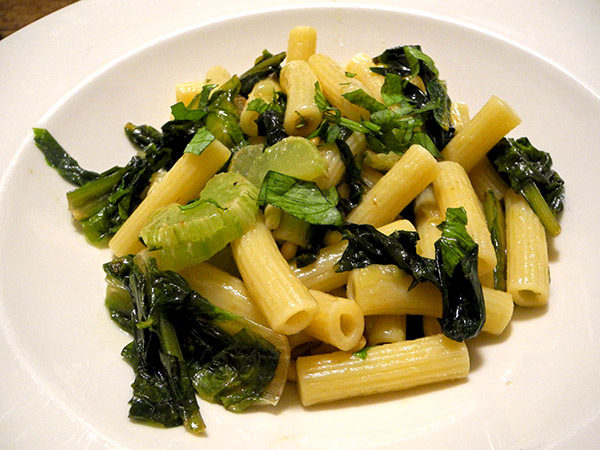 The flavor might be described as a slightly nutty take on celery and bok choy. I don’t really need any analogies myself; I do know that from now on I will be looking for every opportunity to enjoy it again. After talking to Zaid about the stalks he had arrayed on a table, I went home with three of them, which turned out to be the exact number I needed for the treatment I ultimately settled upon, a dressing for a good artisanal short pasta. After only a bit of research on line, in order to learn something more about what I had brought home, I decided I could risk going forward. The recipe I used was entirely my own. It was delicious, possibly the most delicious mix of greenery and pasta I had ever put together, and I think I’m something of a veteran in that kind of campaign. The colors and the textures were a bonus. Note: I don’t know of any reason why olive oil couldn’t be used to brown the celtuce ‘coins’, making this dish entirely vegetarian, and I don’t even know why I didn’t use it myself yesterday. The image above is of the display of celtuce at the Norwich Meadows Farm stand on Monday. It was not a Greenmarket day, so there was no fish in the house, and I didn’t feel like preparing meat on the first day of summer. I always have both dry and fresh (frozen) pasta, and I did have a small baby fennel bulb, an enormous amount of fennel fronds, some cherry tomatoes, and some spring red onions, and I was fain to use these seasonal gifts before they turned [there, I did it; I used ‘fain’ in an conventional context; it’s something I always wanted to do, although I knew I’d never have the nerve to use it in speech]. As it turned out, what I didn’t have, was a simple package of penne or any other stubby pasta. 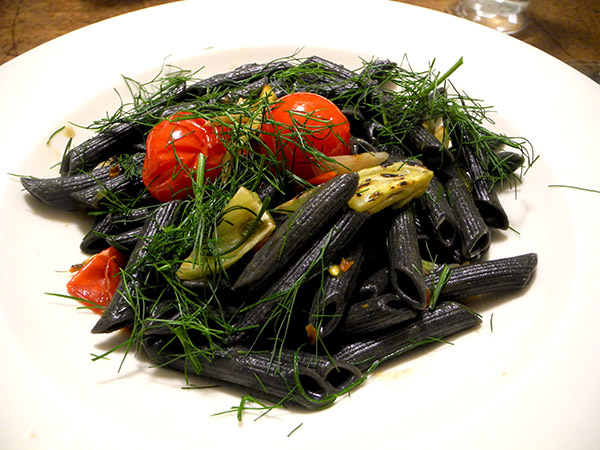 I didn’t want to use long pasta, so I reached for the squid ink penne I’d been saving for something particularly appropriate to its strengths. Once again last night I had the chance to appreciate why striped bass are so popular, and part of the reason why they command a somewhat premium price in the local markets. The daily limit is still strictly controlled, on Monday my fishmonger told me it had been slightly relaxed for the size of their operation, so we may be able to enjoy a little more this year (meaning I won’t have to show up at the Greenmarket at dawn to bring home part of their catch (not that I ever have). As for the recipe I used this time, because I had no interest in turning on the oven on a hot and humid evening, I consulted my files for a formula which could be implemented on top of the stove. 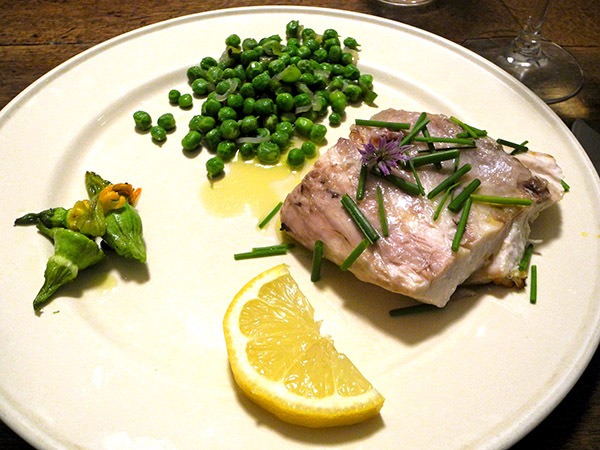 I did not however take advantage of Martha Stewart’s suggestion that the dish I ended up producing with her simple recipe could have been served at room temperature, mostly because I wanted it to relate to the temperature of the tiny fresh peas I had also picked up that day. one 15-ounce striped bass fillet from P.E. & D.D. Seafood, marinated for half an hour (half of that time in the refrigerator) in a mixture of olive oil, lemon juice, thyme branches from Eckerton Hill Farm, squashed organic garlic cloves from Trader Joe’s, then removed from the marinade, and allowed it to drip dry (with the help of a paper towel) placed on an enameled grill pan on top of a medium-high flame, skin side down, seasoned with salt, grilled until skin was lightly browned and starting to crisp, before being turned and cooked through, or about 10 minutes, and garnished with chives from Lani’s Farm cut in 3/4-inch lengths (also one chive flower, prominent in the picture above) and lemon wedges. We were enjoying a beautiful foggy evening on the Hudson last night until some time after ten, part of the GORUCO (Gotham Ruby Conference) ‘Yacht Party’. We didn’t arrive back home until 10:30, but I had promised us ahead that we would still have a good dinner at home (it wasn’t a ‘school night’, so the prospect of a late dinner was reasonable). 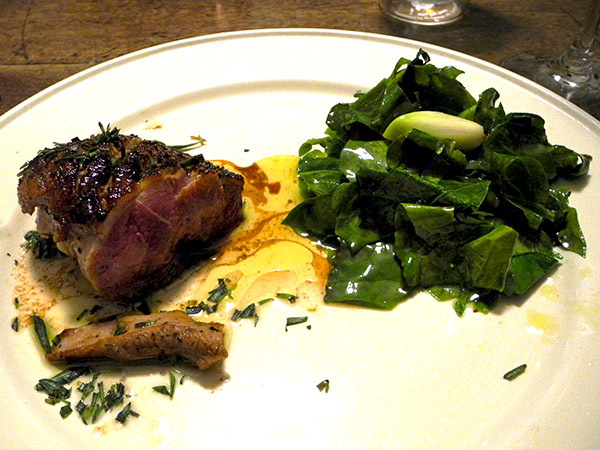 Duck can be pretty quick work, as can wilting some fresh greens, and that was my plan. I had anticipated the meal when I bought a small (11-ounce) breast the day before; I was also anxious to taste an unusual find at the Greenmarket broccoli greens! The amounts of both were modest, so we were able to enjoy a cheese course, and some more of the crusty sourdough bread from the day before. By the way, the little ‘finger’ of duck below the larger piece is one half of the tenderloin; it had been seasoned as well, and was added to the pan only for a minute at the end of the cooking.